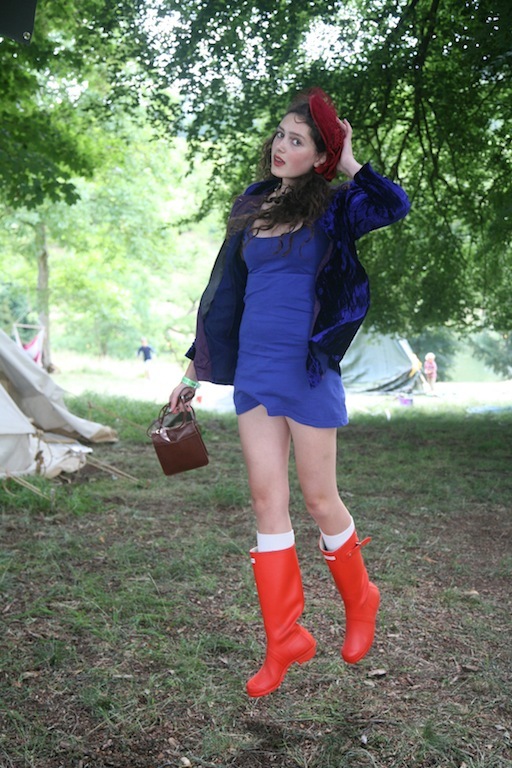 WOW Rosalind seeing you wearing your Hunter Wellies makes me very excited, you look adorable. I have never been to a music festival, I'm not a fan of crowds, but they always look so fun! Ohhh your beaded mask is lovely Rosalind! This looks like an amazing festival! And thanks for your lovely comment! It's the first for my new blog😊. Also, I've been thinking about your green dress from the last post, and I've figured out what it kind of reminds me of: Scarlett o'hara's green dress!!! So much fun to be had in the world!!! There's dressing up, eating wonderful food, and dancing to live music, enjoying all the heady sensations of that precise moment in time. I think my favorite shot, if I just had to choose, would be the one where you're jumping up in the air. It looks like you're about to fly away, magically. What a fun environment for fashion experimentation! Outdoor festivals are the best. You guys look phenomenal. Gorgeous pictures! I love your stripy tunic, you look like you've stepped straight out of the Sixties with the grainy photograph. What a fun event! I love the first photo, it's so pretty. And your 1am smoked salmon and crumpet snack sounds wonderful! I'm going to add both those things to my grocery list! I do agree though, that a festival is something more than the sum of its parts. I feel like they are almost like rites of pasage. I do love how dressed you got, thank goodness it wasn't Glastonbury weather where everything would be ruined! I went to a festival like that once and everything I owned came back caked in mud. And thank you for the lovely comment on my blog. Actually it was in part your older posts about Hay that helped inspire the idea of going there on a honeymoon. I'm just about done reading all the books I got there! Only the big book on Turner and the Jack Vance left. Ahhh it looks like you had the most wonderful time at Wilderness! I love both your lovely practical daytime gear and then the utterly splendid drama of your dress-ups for dancing away the night. You both look great and clearly had a ball, I'm so glad. Pic no 7 is the embodiment of festival fun! Sounds like a fabulous, fun time. I love my Hunter boots. Every girl in New York has a pair! You must considering you have to walk through all kinds of slush and rain and mud. Had to google Bakhtin. Thanks for teaching me something :). Rich, lovely prose. I particularly enjoyed this piece. 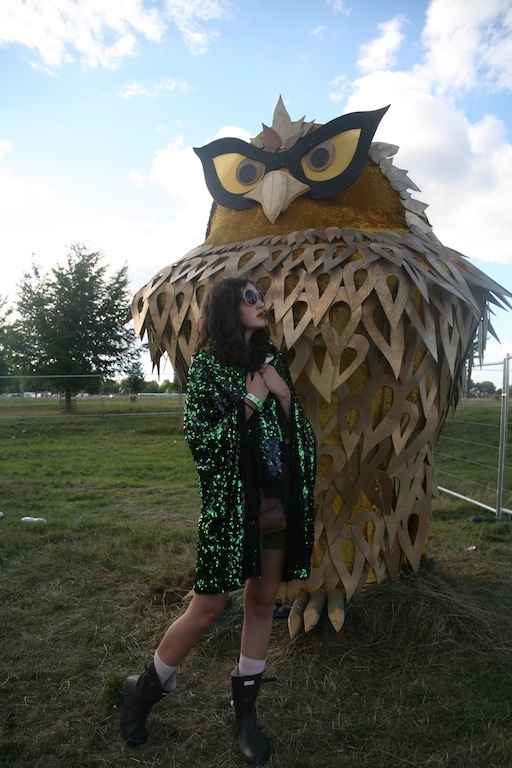 So much fabulousness in one post, your delicious descriptions of food, music, dancing and your awesome time at Wilderness. All the photos and clothes are gorgeous (I can't stop looking at that photo of the beautiful lake). Something I love most about this post is that it's packed with sparkles and shiny things...that glitter eye make-up looks stunning on you and brings out those gorgeous green eyes. And I know I guy who would be incredibly envious of that amazing sequined cape. What fun!!! It sounded and looked like wonderful good time's! Your photo's were fantastic as usual, and your writing had me floating along with you enjoying your fish and chip's! 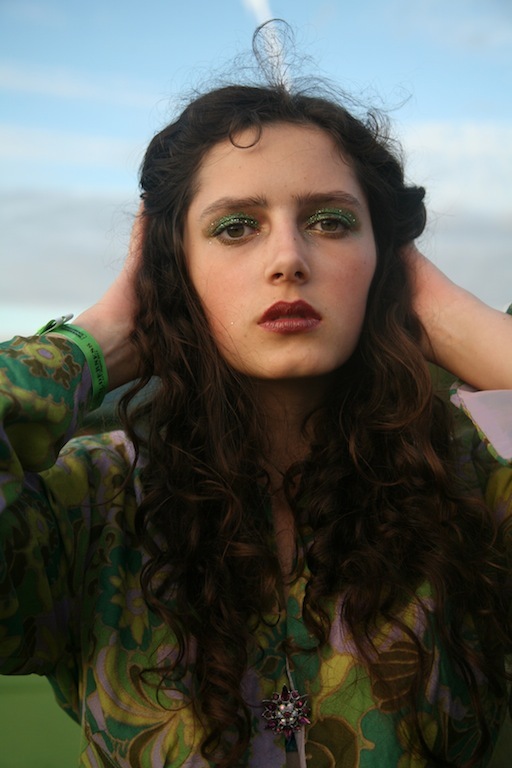 Wow great photos, that sequin jacket is incredible! Lovely memories there must be- and what a great set of photos. You're such a great creature. What fun that must have been. You both look pretty and carefree.